Once you get the Grim Reaper assembled and ready to shoot, I think it's a pretty decent mechanical/expandable broadhead. To assemble it, though, you may need a magnifying glass, a pair of tweezers, some very steady fingers and a lot of patience. Whoever engineered the "guts" of the Grim Reaper did not have simplicity in mind. In my opinion, you shouldn't need to have a sheet of detailed instructions on how to put together a hunting broadhead. You need those instructions with the Grim Reaper, though, otherwise you might leave something out, put it in the wrong place, or insert it upside down. Pretty annoying, in my opinion. The Grim Reaper did shoot very well with field-point accuracy, and the blades are nice and thick at .030". The blades "snap" into the upright position for the shot and do not need an O-ring or rubber band of any sort. Upon impact the blades simply fold out and lock back into position. If putting this broadhead together were only that simple! The Grim Reaper has a "Trocrazor" tip that promises to wreak havoc on bone, and has small razors in the tip as well. Cutting width on this head is 1 3/8", which is a pretty big hole. I was not impressed, however, with the sharpness of the blades out of the package. They were not what I would consider razor sharp. I got them razor sharp with a little effort, but still, it would be nice if they were razor sharp right out of the package. To test the durability of the Grim Reaper on something similiar to the shoulder blade of a deer, I shot it through a sheet of 1/4" plywood at a distance of 30 feet. It passed completely through with no damage to any part of the head. 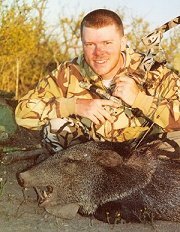 I tested the Grim Reaper 125 out on a Javelina hunt in south Texas in 2003. I shot a big boar javelina with a quartering away shot from the ground at 20 yards. The arrow entered near the back of the ribcage and angled forward. A javelina's anatomy is different than a deer and it's spine dips low into the body at the front as it goes into the neck. My arrow entered halfway between the bottom of the chest and the top of the back, but it hit the spine solidly as it was about to exit, and stopped there, also dropping the javelina instantly, killing it within about 30 seconds. The broadhead made a wreck of the liver and lungs before breaking the spine. When I retrieved the head, one of the blades was bent, but the head was undamaged otherwise. I would not recommend shooting the Grim Reaper from a blind such as the Double Bull, with shoot-through netting. I shot at a turkey 10 yards away from a Double Bull, and when the broadhead hit the shoot-through netting it went haywire, like a rudderless missile. The Grim Reaper performed pretty well in the field, but I personally will continue to use fixed-blade heads. 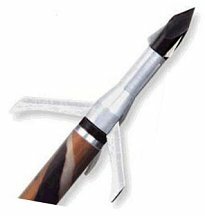 The bottom line question for me is, does the mechanical/expandable head do anything for me that my fixed-blade broadhead doesn't do equally good or better? The answer for me is no. I just have more confidence in the sturdiness of my fixed-blade heads. If I were going to use a mechanical head, the Grim Reaper wouldn't be my first choice, or my second choice. There are other mechanical heads out there that perform as well or better, and are a lot more user-friendly.